MIDTOWN MANHATTAN – As Donald Trump’s chances of winning the White House steadily increased on Tuesday, and NBC and MSNBC steadily refused to call one state after another until the last plausible moment, and progressives and leftists and liberals began dusting off resentments from February and April and May that in hindsight showed, they said, why Hillary Clinton was losing to the celebrity real estate developer from Queens, a scrum of sniveling, red-hatted reptiles scrambled over each other to gain access to the Republican presidential candidate’s inner lair, with its cash bar and limited seating. Make America Great Again hats changed heads. 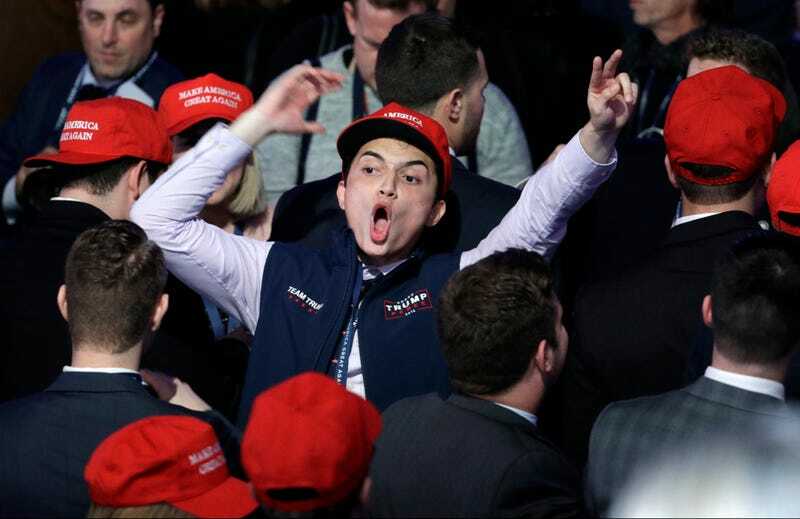 College Republicans threw their heads back and guffawed with men in sports coats, t-shirts, and jeans. One had Mardi Gras beads around his neck. Another wore a Bluetooth headset. They all gripped their girlfriends elbows a little bit too firmly. “I want to see Hillary’s speech,” one woman said. “Ha ha ha!” a male interlocutor replied. “What is she gonna say: ‘It’s rigged?’” she continued. “HAH HAH HAH!” the man said. His giddy and joyless laughter crawled under the skin of those listening. Intermittent chants of “Lock her up!” and “Build the wall!” sprang up. For hours they waited, in the hopes that Trump would end his presidential campaign as it began—on a moving staircase, grinning that Cheshire Cat grin of his. “I’m sure there’s a secret entrance, you know,” one supporter said. “But maybe he’ll come this way. To show his gratitude.” He did not, making his way to the Victory Party by some more private avenue, the less likely to be bothered by reporters or supporters or detractors. Outside, his triumph having been declared, the streets were quiet. A reporter pulled his jacket over his head and screamed. How did this happen? It was already happening, we just didn’t know, or we did, and we didn’t know the extent to which it was happening, or we didn’t care—and in the end, maybe there was never really a difference. I&apos;m Going To Vomit, How About You?